On a particularly hot July day, Bob and I decided to seek cooler temperatures along the lakefront here in Toronto, so we loaded our bikes and made for Tommy Thompson Park. 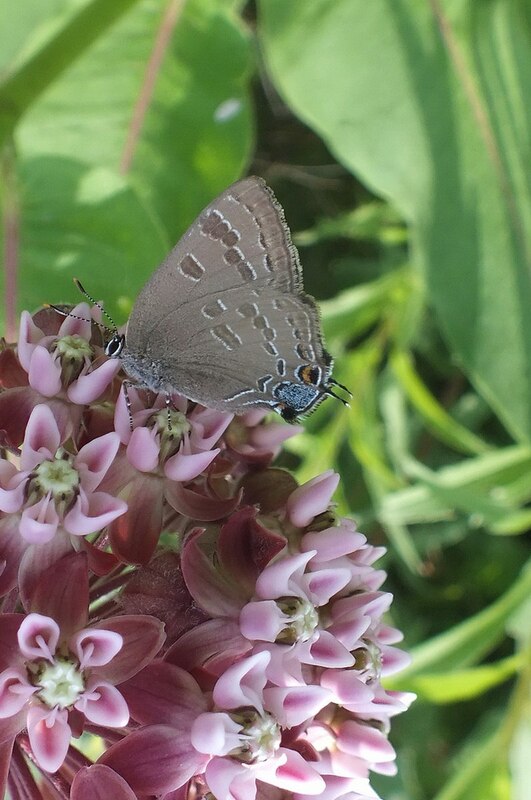 There, along the bicycle trail, Bob spotted this dainty Hickory Hairstreak Butterfly (Satyrium caryaevorum). It was a Lifer for us. 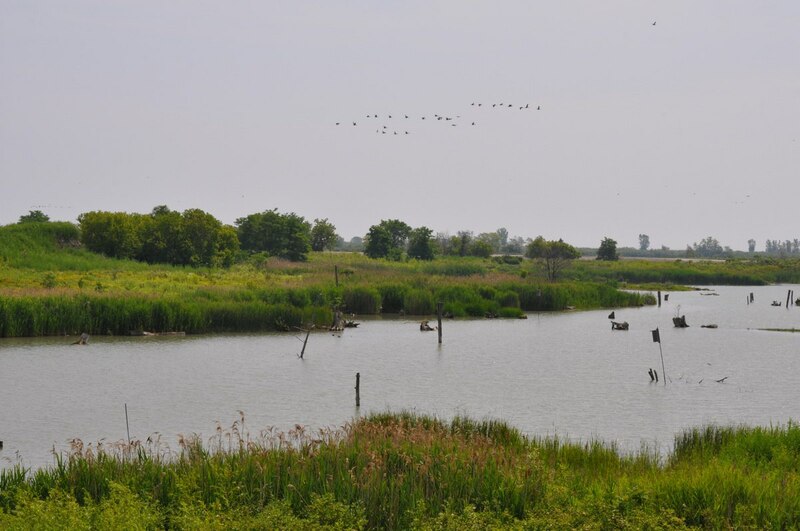 Tommy Thompson Park is one of our favorite urban parks because it offers the possibility of a variety of wildlife encounters owing to the varied habitats along the length of the man-made peninsula. While scoping out the construction of new cells on the east side of the Leslie Street Spit, in search of shorebirds, we also paid special attention to the wildflowers growing at the side of the trail. 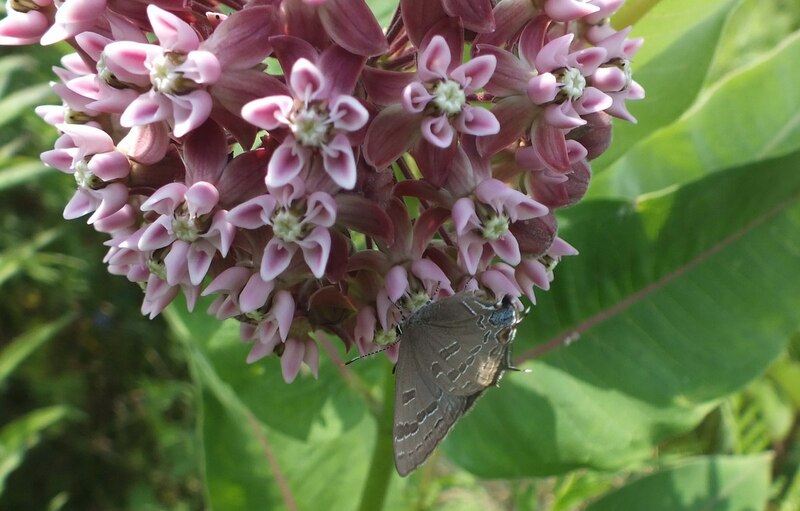 I had been charged with scanning the stands of milkweed on the west side of the gravel path, while Bob kept to the opposite side and searched the plants there for any sign of insects. I was amazed that he picked out the diminutive body of this Hickory Hairstreak Butterfly. It’s colouring is subtle, and it was only about the size of Bob’s thumbnail! Bob beckoned me to “come quickly” with my little Fuji camera because it allows me to take micro and macro photographs if an insect allows us to get close enough. 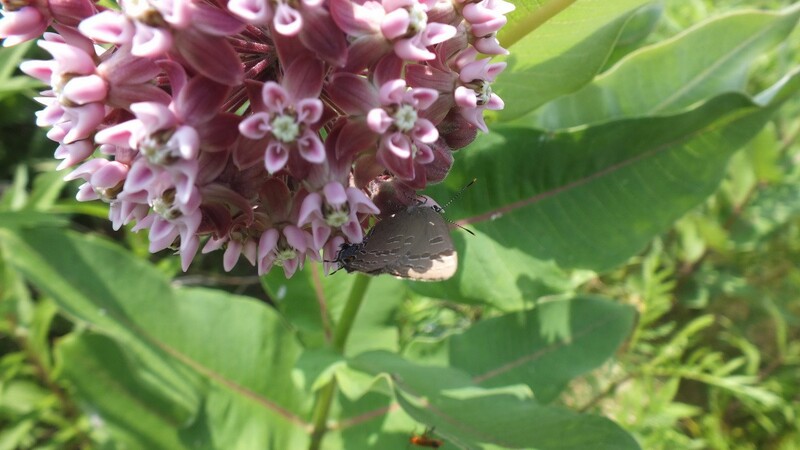 I was certain that the little butterfly would fly even before I got to Bob’s side, but it hung tight there on the milkweed flowers for several minutes. Hickory Hairstreak Butterflies are hardly ever seen with their wings open so a view of the dorsal surface of the wings is almost impossible. This small butterfly has a wingspan of only 22-28 mm (.9-1.0 in), and, as is clearly visible in my photo, each hindwing has one tail. It is the blue tail-spot accompanied by a shorter black-capped orange eyespot that is diagnostic for this species. A Hickory Hairstreak Butterfly winters as an egg that has been carefully laid at the end of a twig, and when it hatches in the spring, the green slug-like larva feeds on the leaves of select species of trees. 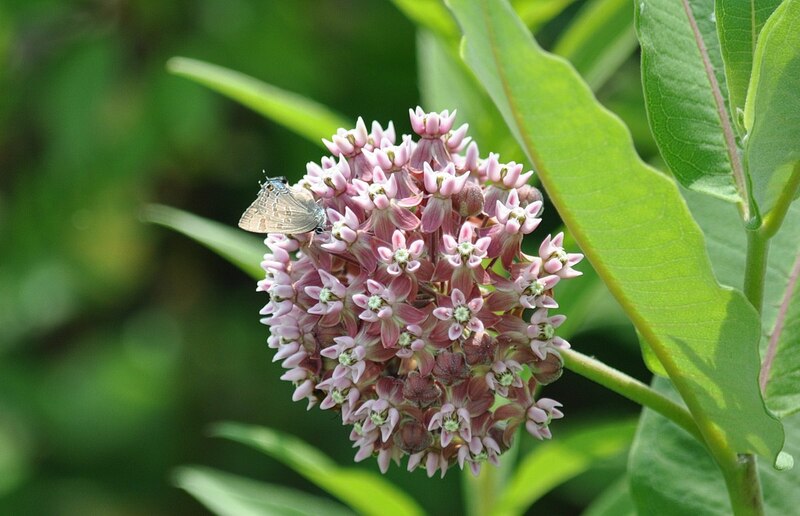 It is in late June or early July that the caterpillar emerges as an adult, and one of its preferred foods is the nectar of Common Milkweed seen here in these photos. Hickory Hairstreak Butterflies have a very limited range in Canada that being only in southern Ontario and southern Quebec near the border of Ontario. They are considered rare throughout their range, and here we had Bob espying one obscure little specimen as he whizzed by on his bike. Wonders never cease. 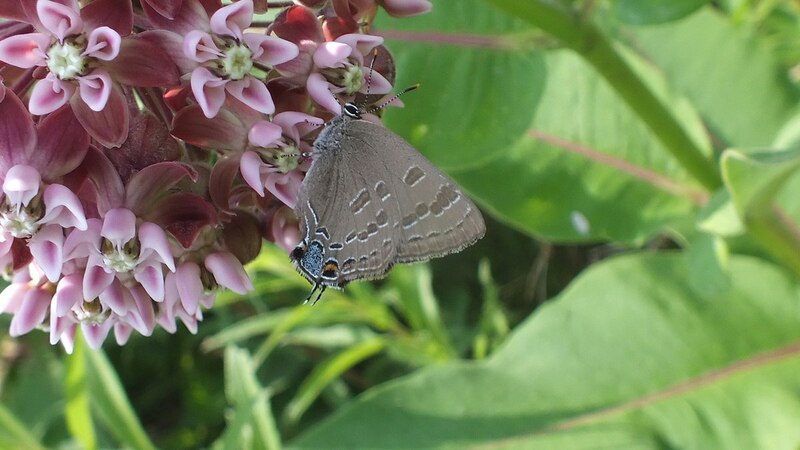 Hickory Hairstreak Butterflies occupy a habitat that is rich in Staghorn Sumac, White Sweet Clover and Common Milkweed where these plants grow in close proximity to deciduous woodlands. 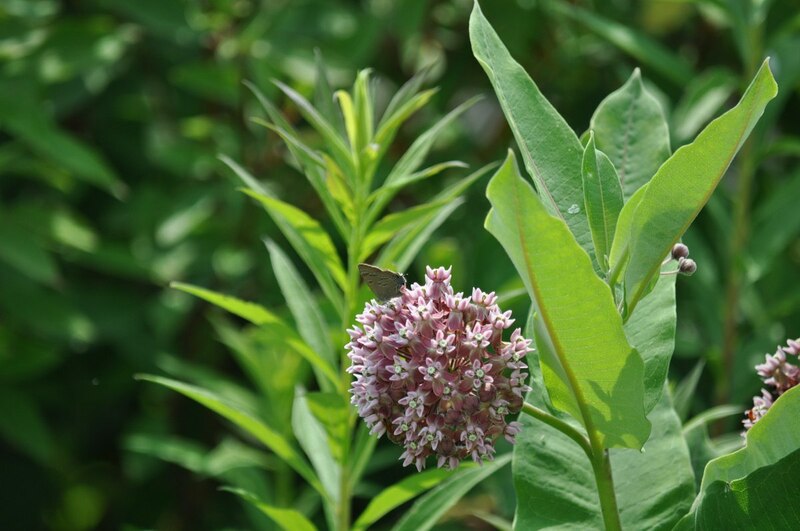 As adults, the butterflies fly until early August as the only generation each year. We had timed up our bicycle ride perfectly to catch this little gossamer-winged butterfly with the newly-minted wings.